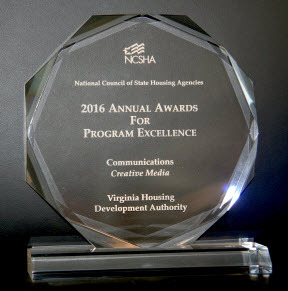 VHDA recently won two national awards recognizing outstanding affordable housing programs from the National Council of State Housing Agencies (NCSHA). Our Rapid Rental Loan Refinancing and Retention Program won in the Management Innovation – Financial category for creating a proactive approach to retaining loans in VHDA’s multifamily portfolio. By approaching multifamily mortgagors with a simplified and virtually cost-free refinance process before their loan prepayment dates become available, the program has been able to refinance and preserve more than 15,000 affordable housing units in Virginia. Find out more about our multifamily financing. Also, our MCCs Made Simple entry won in the Communications – Creative Media category for creating an informative animated video to describe the benefits of our Mortgage Credit Certificate program. MCCs can boost the tax benefits of owning a home for first-time homeowners in Virginia – potentially saving them money at tax time every year – for as long as they live in their home. 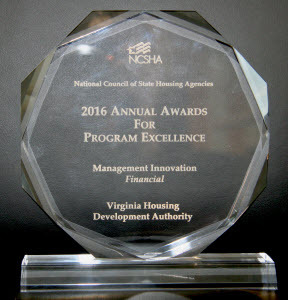 The NCSHA’s Annual Awards for Program Excellence honors state housing finance agencies for their outstanding public purpose programs, projects, and practices. The mission of this prestigious awards program is to recognize exemplary HFA efforts, share information among HFAs, identify industry best practices, and encourage HFA innovation. 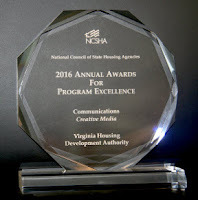 The awards were presented recently during NCSHA’s Annual Conference and Showplace.